Never before has a pouch laminator completed jobs with such speed and grace. The Speedy Lam will laminate at a staggering 12 feet per minute (or 144 inches per minute), allowing letter sized laminating pouches to be run every 5 seconds. This is accomplished with the 10 rollers located inside the machine that power through while still providing perfect pressure and even temperature to offer an attractive finish. This innovative laminator features 6 heated rollers, 2 cooling rollers, and 2 outlet rollers, all contributing to the unsurpassed speed. These features ensure high quality results even on difficult to laminate items such as photos, inkjet prints, and color copies with heavy ink coverage. The patented cooling system keeps the exterior of the laminator cool to the touch even when doing high volume production runs – so there is no need to worry about a fire hazard if placed near fabrics or other flammable objects. The Speedy Lam 330R cool down cycle is easily activated by pressing and holding the power button. The cooling fans will continue to run until the machine has reached the correct shut down temperature. When the system is cooled it will automatically shut itself off, thus preventing damage to the heated rollers. If you have been in the industry as long as we have, then you know that simply shutting the laminator off is one of the worst things you can do to your laminator rollers. This cool-down function eliminates any possibility of that mistake, ensuring that your interior laminator rollers stay in prime condition for years to come. The James Burn Speedy Lam 330R Pouch Laminator has a 13” throat width, so you can laminate all of your documents up to 13 inches wide. The warm-up time takes just five minutes, and this power horse laminator has the capability to handle any laminating pouch as thick as 10 mil on both sides (20 mil total). It even works great with foil fusing. The adjustable temperature control gives you the capability to not just laminate hot pouches, but cold, or pressure sensitive, laminating pouches as well. This function is adjustable from 0°, all the way up to 160° C.
The reverse function will prevent jams and roll-ups when you are not using a pouch carrier. 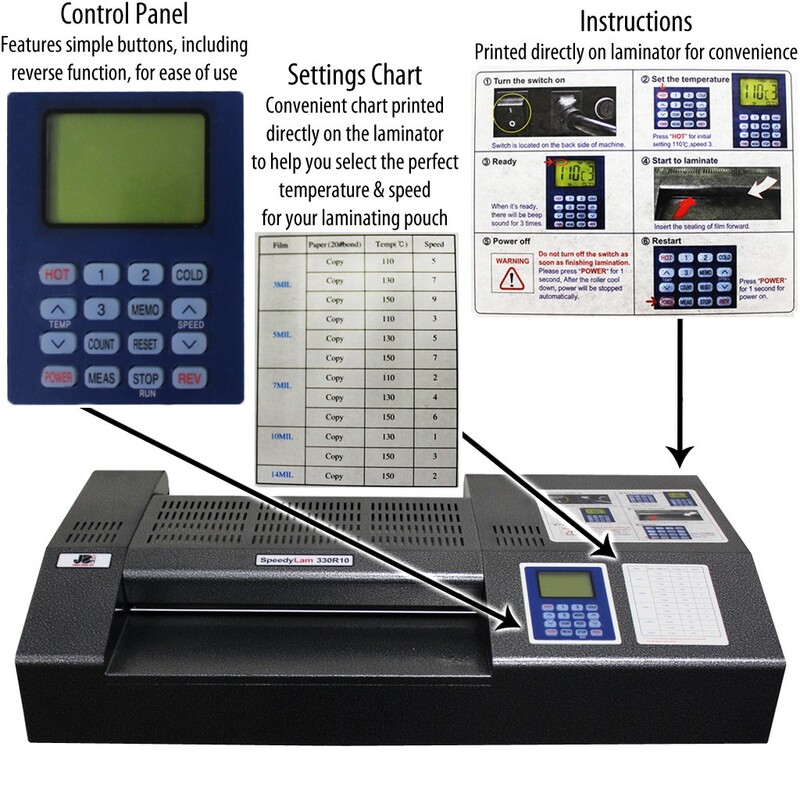 The Speedy Lam is one of the larger pouch laminators that we have encountered; however, it can still fit on almost any desk space without a problem. It is just 25" wide by 13 ¾" deep, by 5 ¾" tall. That’s not all, the Speedy Lam also comes standard with a 90 day manufacturer’s limited warranty. 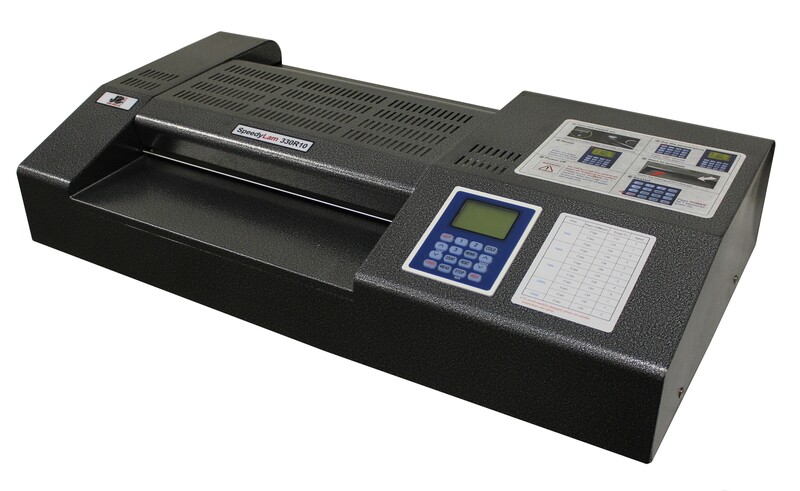 The SpeedyLam 330R10 Pouch Lamintor by James Burn is truly the fastest pouch laminator available! It will save you production and labor costs with the first use. • The only weakness that we have encountered is possible the weight and size of the Speedy Lam. It weighs about 50 pounds unpacked, and can therefore be hard to move around for some users.